I started this layout last night and it took all this time to get it done. These are a few not very good photos that were taken on my birthday this year. As they are all I have from this year I figured I'd use them even though there was nothing more I could do to improve them. The layout actually started taking shape when I went into my file of birthday papers planning to scrap Thomas' or Michael's birthday and I saw the sad little Panda Bear. It so suit my birthday this year. I had just gotten out of the hospital a few days prior. Robert had school so Thomas and I went out for dinner alone. I bought our family tradition ice cream cake for myself. I know we waited for Robert to be home to have the cake but for some reason there were no photos with him in them. I am entering this in Die-Cuttin Divas challenge #141 Buttons. 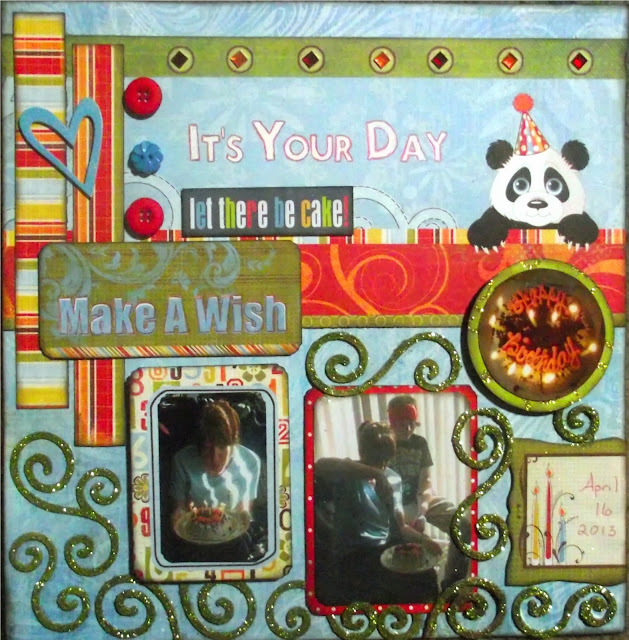 (I of course also used die-cuts - the swirls are one of my favorite Sizzix dies which I cut in various patterns and coated with paint and glitter.) I used bright seasonal colors for the Try it on Tuesday Color Explosion challenge. I am also entering this in Colorful Creations November Favorite Things challenge. The assignment was to pick a favorite thing you are thankful for that is outside the box of family, loved ones and friends - more like a cup of coffee, a sunset etc. The reason I am entering this layout as it is one of our favorite family traditions to have an ice cream cake that is served on a platter that matches my Pfaltzgraff Tea Rose dishes but says Happy Birthday on it. I love having ongoing family traditions, this is my favorite set of dishes and who wouldn't love ice cream cake? and of course it is now quite late as usual and I need to hurry off to bed as I have early appointments tomorrow for my mammogram and with my hematologist. Hopefully soon I will have some answers to the confusion and fatigue that has been plaguing me this year. Thanks for stopping by. Please come back again soon! A wonderful layout, fantastic colours. Thank you for sharing it with us at TioT's this time. What a cool layout! I love it! What a very pretty layout! Thanks for joining us at DCD this week! FALL MAY BE UPON US BUT SUMMER SAYS HELLO!